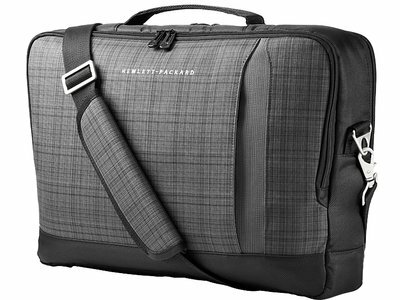 The HP Slim Ultrabook Top Load-a stylish, durable, and compact carrying case built for your Ultrabook . A black twill fabric accented with gray plaid combines form and function to help protect your hardware and give you a polished appearance. The HP Slim Ultrabook Top Load—a stylish, durable, and compact carrying case built for your Ultrabook™.1 A black twill fabric accented with gray plaid combines form and function to help protect your hardware and give you a polished appearance. One-year limited warranty. Additional support is available 24 hours a day, seven days a week by phone as well as online support forms. NOTE: Certain restrictions and exclusions apply. Consult the HP Customer Support Center for details. 1 Ultrabook is a trademark of Intel Corporation in the U.S and other countries.